Chinese wholesale gold demand, as measured by withdrawals from the vaults of the Shanghai Gold Exchange (SGE), reached a sizable 973 metric tonnes in the first half of 2016, down 7 % compared to last year. 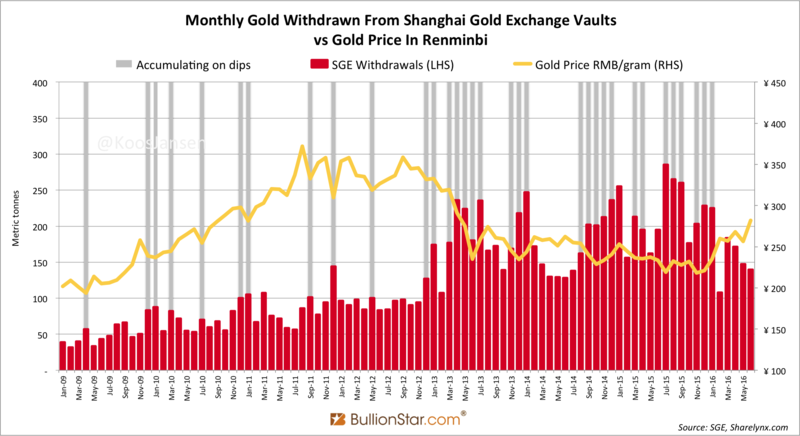 Although Chinese gold demand year to date at 973 tonnes is slightly down from its record year in 2015 – when China in total net imported over 1,550 tonnes and an astonishing 2,596 tonnes were withdrawn from SGE designated vaults – appetite from the mainland is still the greatest of all single nations worldwide. 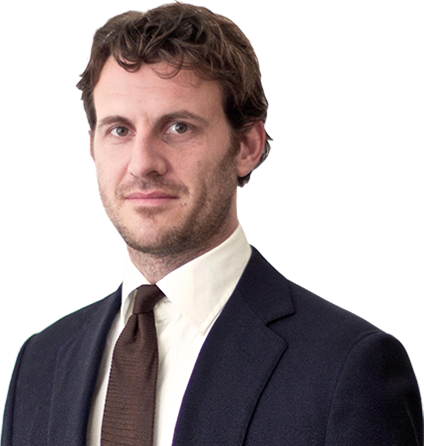 At the same time the mainstream consultancy firms (World Gold Council, GFMS, Metals Focus) continue portraying Chinese gold demand to be roughly half of SGE withdrawals, as these firms measure “gold demand” merely at retail level which excludes any direct purchases at the SGE by institutional and individual investors. But to reassure you, Chinese wholesale gold demand still equals SGE withdrawals. In the month of June (2016) SGE withdrawals accounted for a robust 139 tonnes, although this was down 29 % from June last year. 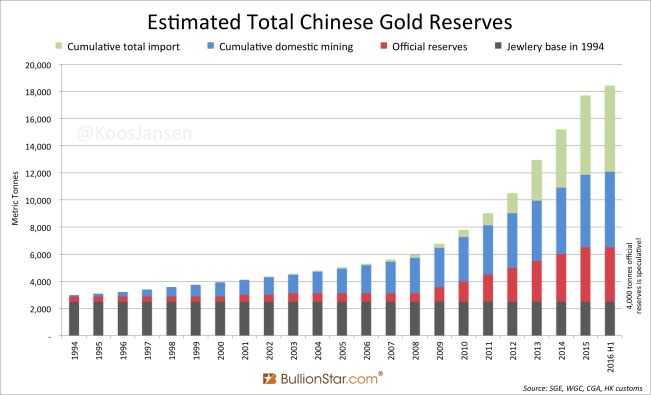 The reason being for “somewhat subdued” Chinese gold demand in recent months is that the price of gold has risen strongly over this time horizon and the Chinese tend to buy gold when its price goes down, in contrast to Western investors that buy gold when the price goes up. From 1 June until 30 June 2016 the price of gold in US dollars jumped by 9 % from $1,214.70 to $1,325.76. Over the first six months of 2016 the price of gold exploded by 25 % (from $1,061.5 on 1 January 2016). 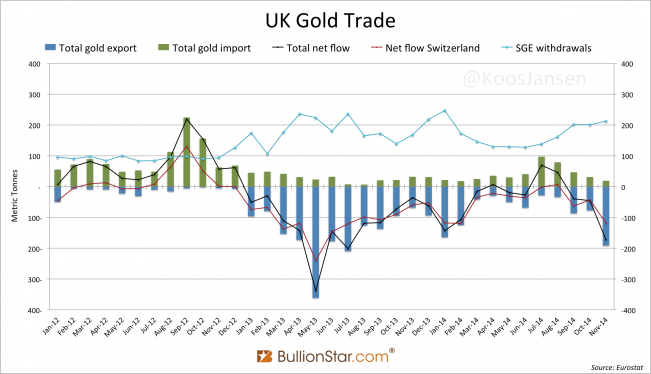 So, since January this year when the price of gold started to rise, the Chinese actually stepped down their gold purchases while Western demand, which can be roughly measured by the net flow in/out of the UK, went up impressively. Let us have a look at a few charts to come to grips with what’s going on in the Chinese (and international) gold market. Below, we can see a chart showing monthly SGE withdrawals plotted against the end of month price of gold in yuan per gram. In recent years, whenever the price of gold goes down the Chinese step up their purchases (buying the physical supply coming from the West) and whenever the price of gold goes up the Chinese slow their purchases. Since January 2016 when the gold price started rising, SGE withdrawals started declining. Note, for spotting trends, gold bought at the SGE does not have to be withdrawn immediately. 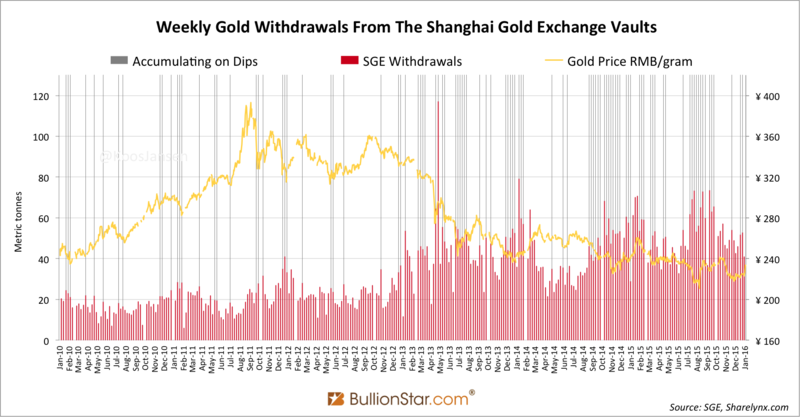 By looking at a weekly SGE withdrawals chart (from before January 2016) we can see the trend just described – “the Chinese tend to buy more gold when the price goes down” – in a more granular fashion. Have a look below. The SGE published weekly withdrawal data until January 2016. 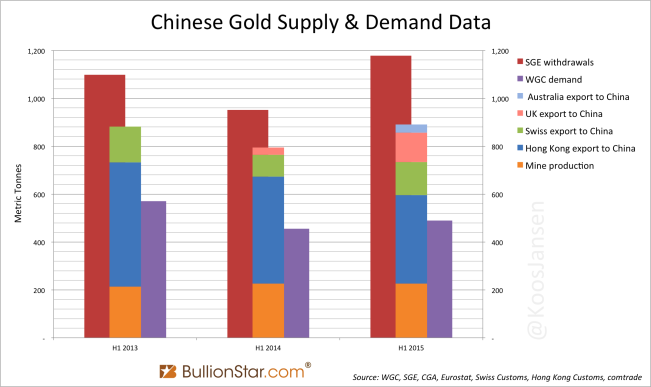 In contrast to Chinese gold buying behaviour, let us have a look at gold demand from the West. Our proxy for Western demand is the net flow in/out of the UK where the London Bullion Market (LBMA) and the world’s largest ETF’s such as GLD store physical gold. 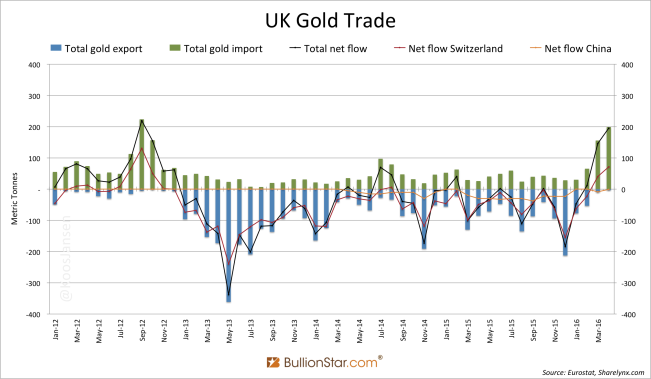 At the beginning of 2016 (when the price of gold started to rise) the direction of the flow has reversed sharply, from the UK being a net exporter to being a net importer. From being a large net gold exporter in 2013, 2014 and 2015, the UK is now one of the largest net importers. 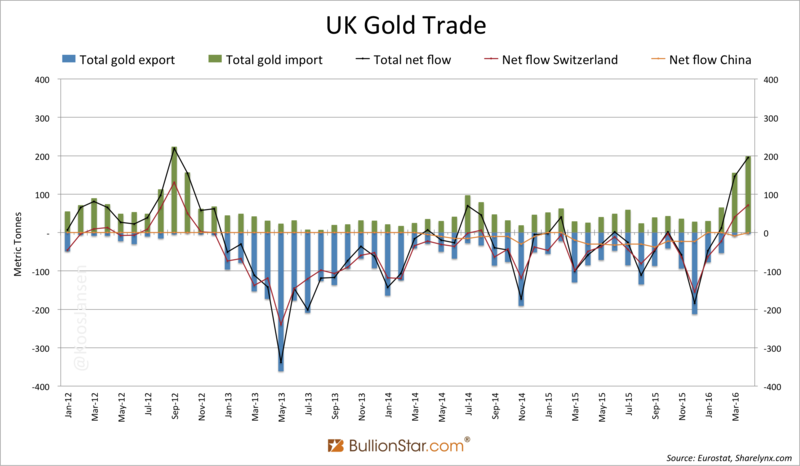 In April 2016 the UK net imported 195 tonnes of gold – while export to China was nil. 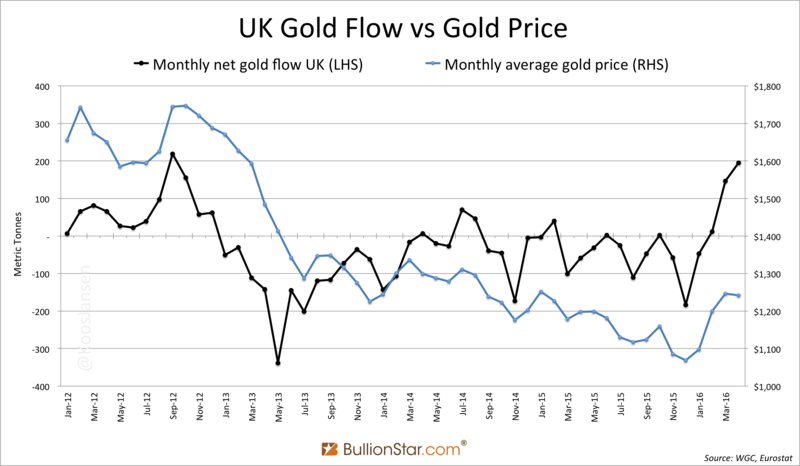 If we look at a chart that reflects the net flow of gold into the UK versus the gold price, we can clearly see the correlation. A declining gold price (blue line) coincides with the UK net exporting gold (black line) and vice versa. 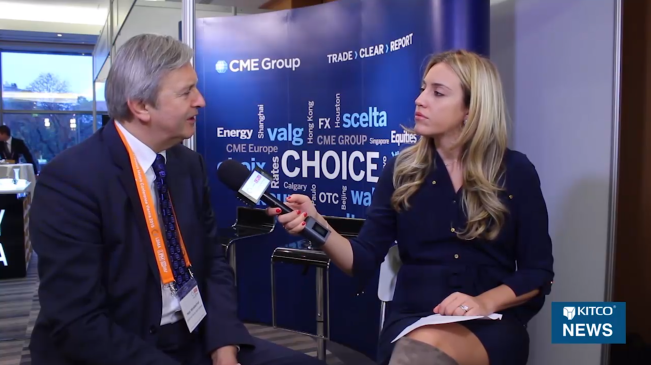 The impressive gold rally year to date, and the accompanied massive growth in GLD inventory in London, predicts sustaining net gold imports by the UK in May and June. 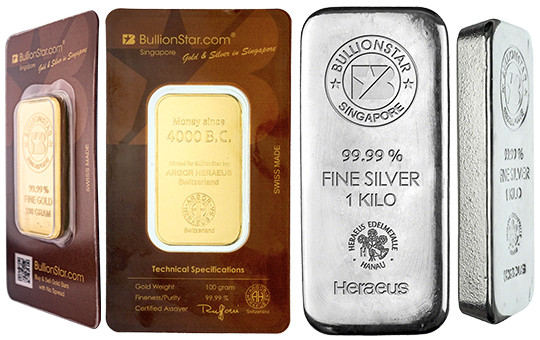 In a forthcoming post we’ll discuss more thoroughly how above ground gold stock is moving between which nations and how this correlates to the price of gold. International merchandise trade statistics always lag a few months, so I don’t know exactly the total amount of gold China has net imported in H1 2016. 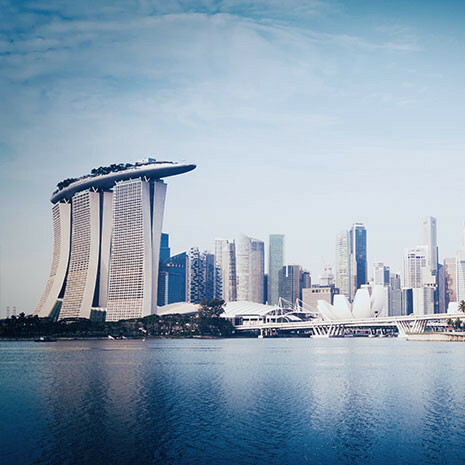 That I know of, China has net imported 368 tonnes year to date, according to trade data from Hong Kong covering January-April, the UK covering January-April and Switzerland covering January- May. 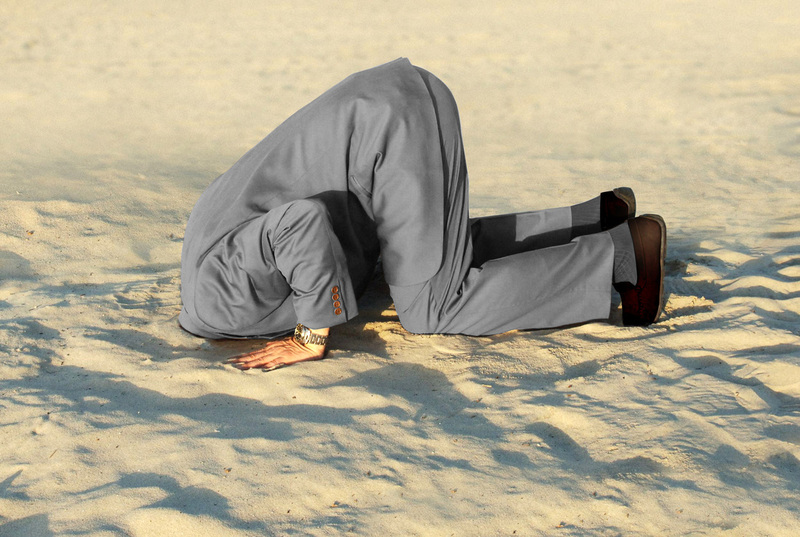 Australia’s export data is not clear yet. If we project the pace of imports to to six months, China has “at least” imported 512 tonnes of gold in H1 2016. Supply to the SGE can only come from import, domestic mine output or scrap/disinvestment. As, import accounted for 512 tonnes and domestic mine supply for 225 tonnes, consequently scrap/disinvestment through the SGE must have been approximately 236 tonnes in H1 2016. By using our preliminary estimate of 512 tonnes for China’s net import in H1 2016 and mine output at 225 tonnes, there are currently an estimated 18,444 tonnes of gold within China. Assuming the PBOC has accumulated about 4,000 tonnes by now which has not been supplied through the SGE, that is. For a detailed explanation how I conceived this estimate please read my post “PBOC Gold Purchases: Separating Facts from Speculation”. If my speculative estimate of PBOC holdings would be incorrect, and China’s central bank holds what is officially disclosed at roughly 1,800 tonnes, there are currently an estimated 16,244 tonnes of gold within China. Since I’ve been publishing SGE withdrawals and its relation to Chinese gold demand many others have jumped the bandwagon, though some more successful than others. A few days ago I stumbled upon a “SGE withdrawals chart” from Nomura research with false data. 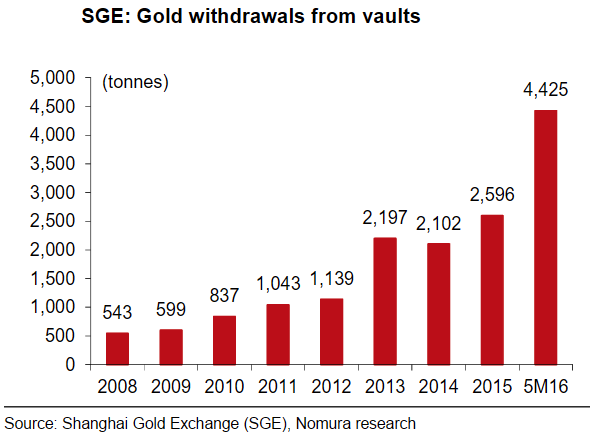 In Nomura’s chart it’s shown that withdrawals from the vaults of the SGE in the first five months of 2016 accounted for 4,425 tonnes. Which of course is false. If that would be true, China should have imported about 3,800 tonnes in five months. No, that did not happen. What Nomura did is grab the “cumulative delivery amount” from the Chinese Market Data Monthly Reports, instead of the “cumulative load-out volume”. The latter is how the SGE refers to “withdrawals” in English. As I’ve written previously the “delivery amount” is not the same as “load out volume”. 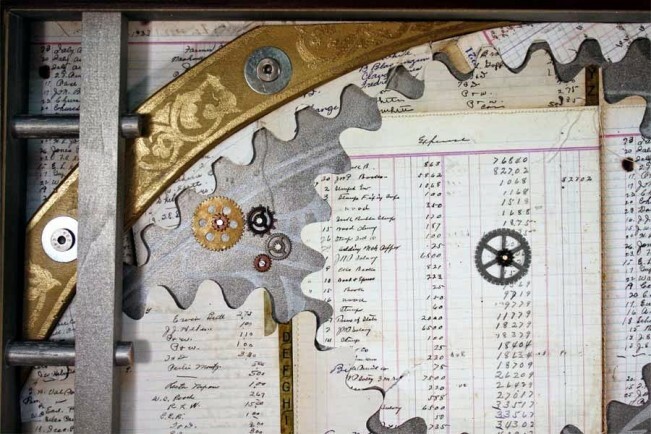 The “delivery amount” reflects the volume of gold that changes ownership inside the vaults, computed as the sum of the trading volumes in physical products and the contract delivery volumes of deferred products, whereas “load out volume” tells to the amount of gold that is withdrawn from the vaults. Let’s have a look at the Chinese Market Data Monthly Report from May, which Nomura used for its withdrawal data for January-May 2016 (“5M16” in their chart). Courtesy SGE. Red numbers added by Koos Jansen. We can see that at number 4 the “cumulative delivery amount” notes 4,425,035.28 Kg, which is exactly what Nomura shows in its chart as “withdrawn”. By and by, the “cumulative delivery amount” is counted bilaterally. 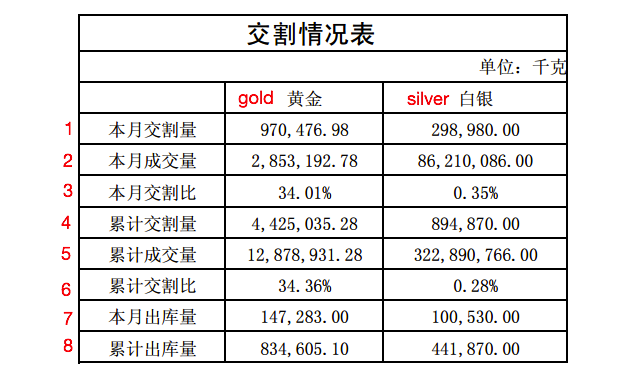 Effectively, half of this amount (2,212,517.64 Kg) is how much physical gold changed ownership inside SGE designated vaults from January until May 2016. 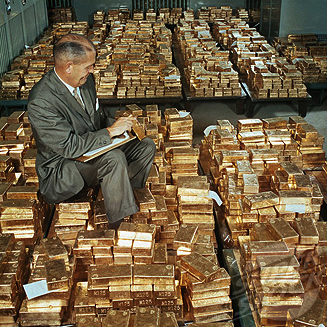 At number 8, we see the actual amount of gold withdrawn from the vaults over this period (counted unilaterally). 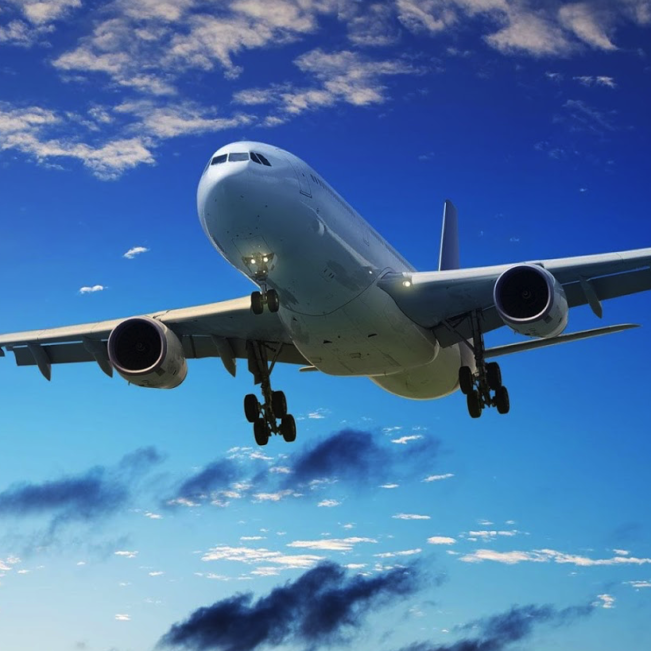 In the first five months of 2016 SGE withdrawals accounted for 835 tonnes. Below is the full explanation of the Chinese trade table. 1) Delivery amount this month, the sum of the trading volumes in physical products and the contract delivery volumes of deferred products for the reported month, counted bilaterally in Kg. 2) Trading volume this month, the sum of all trading volumes in physical and deferred products for the reported month, counted bilaterally in Kg. 3) Delivery ratio this month, the proportion of the delivery amount to the total trading volume of both physical and deferred products for the reported month (1 divided by 2). 4) Cumulative delivery amount, the sum of all monthly delivery amounts from the beginning of the year to the statistical time point, counted bilaterally in Kg. 5) Cumulative trading volume, the sum of all trading volumes in physical and deferred products from the beginning of the year to the statistical time point, counted bilaterally in Kg. 6) Cumulative delivery ratio, the proportion of the cumulative delivery amount to the cumulative trading volume of both physical and deferred products from the beginning of the year to the statistical time point (4 divided by 5). 7) Load-out volume this month, the amount of gold withdrawn from the vaults for the reported month, counted unilaterally in Kg. 8) Cumulative load-out volume, the amount of gold withdrawn from the vaults from the beginning of the year to the statistical time point, counted unilaterally in Kg.